Swaylove has been twisting Villalobos words, and quite frankly I am stepping in. 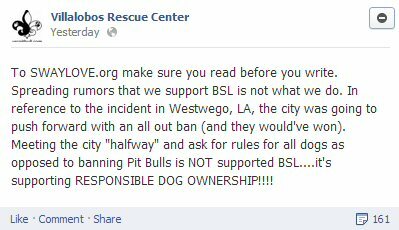 Villalobos doesn't support BSL, and why would they? 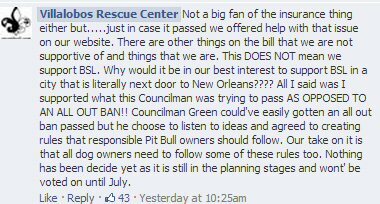 Why would a Pit bull rescue support BSL, what good would that accomplish? Tia and Councilmen Green came to agreement about rules, that all responsible dog owners should follow. If this agreement didn't come forth there would have been an all out ban on the pit bulls. Would you rather the ban, or the rules were you will be able to keep your dogs? Furthermore nothing is in affect yet, not until July were people will be voting yes or no. 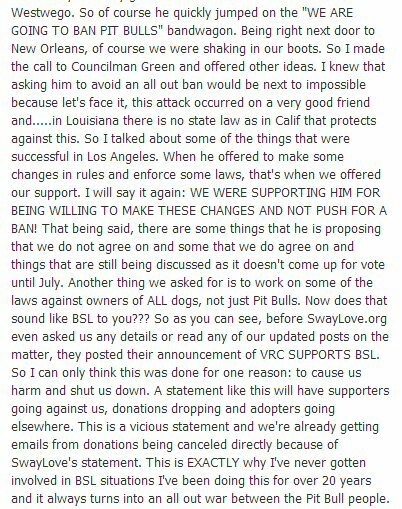 One must understand that compromises and agreements must be made in order to win against the BSL, and unfortunately SWAYLOVE doesn't seem to get that. Granted the insurance Idea is ridiculous and there should be an alternative in this agreement that happened. If we were in Villalobos's position we would make the same decision, in order to prevent an all out ban against a specific breed. Making this type of agreement doesn't mean that they support BSL, it means exactly what Villa Stated. It's in the support of RESPONSIBLE Dog owners. Right now at this moment, we see it as SwayLove losing credibility since they seem to be attacking the wrong side of the field. 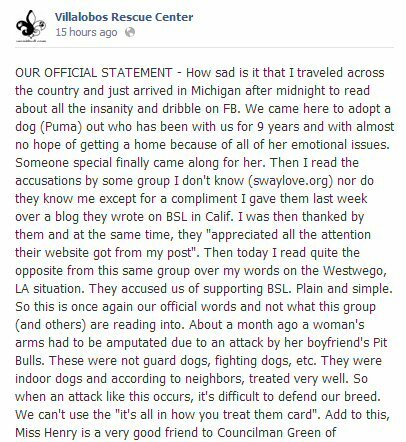 A reputable legitimate rescue organization, that has traveled cross country FIGHTING the bad reputation these bully breeds obtain. And no Villalobos, you shouldn't have to keep explaining yourself, you did the right thing by preventing an all out ban of a specific breed. BSL is one nasty enemy that we all have, they don't understand that "Humans" are the cause for so much damage. I fear they never will understand that and continue to target all and any dog breed. 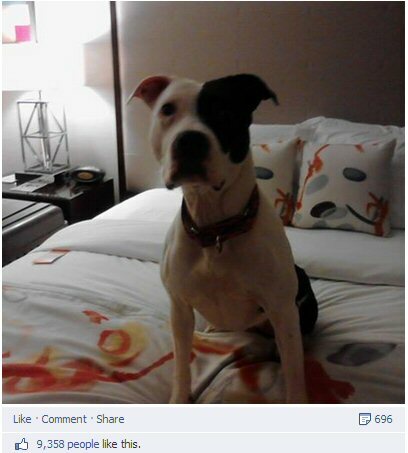 It is organizations like Villa that are here to correct the course that BSL has taken. Swaylove I plead with you, please refrain from targeting Villa for your misunderstandings of what they actually agreed upon. 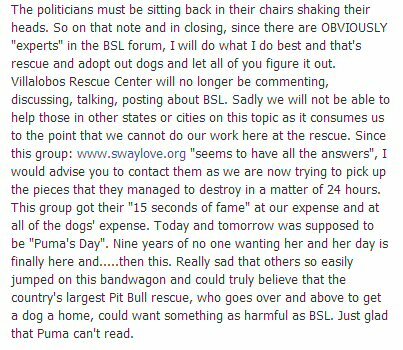 Villalobos is and forever will be against BSL.